A Standard apex shed measuring 2.44x2.44m, ideal for multiple storage uses. The Open Pergola Gazebo Covered Pergola with open sides and trellis Corners. A simple gazebo for your garden measuring 9'8 x 9'8. This Side Entry Arch Gate is constructed from heavy duty tongue and groove. 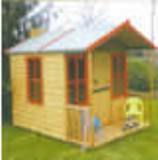 2'11"x5'11"
Devon Log Cabin measuring 3x3m (9'8 x 9'8) built using 44mm logs and ideal for use as a garden office.